James Emory Foxx (October 22, 1907 – July 21, 1967), nicknamed "Double X" and "The Beast", was an American professional baseball first baseman who played 20 seasons in Major League Baseball (MLB) for the Philadelphia Athletics, Boston Red Sox, Chicago Cubs, and Philadelphia Phillies. His most productive years were with the Philadelphia Athletics and the Boston Red Sox, where he hit 30 or more home runs in 12 consecutive seasons and drove in more than 100 runs in 13 consecutive years. When the Great Depression fully hit in the early 1930s, A's owner Connie Mack was unable to pay the salaries of his highly paid stars, and was obliged to sell off a number of them. 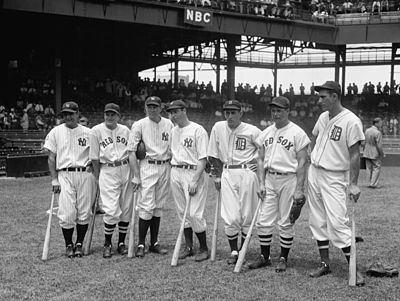 After a 1936 contract dispute, Mack sold Foxx's contract to the Red Sox for $150,000 (equivalent to approximately $2,708,273 in 2018 dollars). 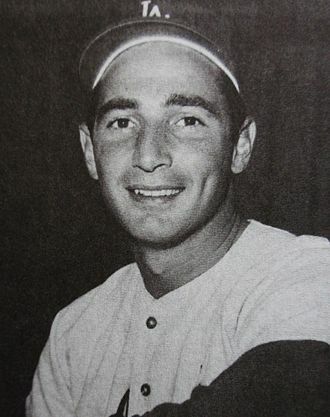 He wound up his career with the Philadelphia Phillies in 1945, filling in at first and third, pinch hitting, and pitching nine games, including two as the starting pitcher. He compiled a 1–0 record and 1.59 ERA over 22​2⁄3 innings. 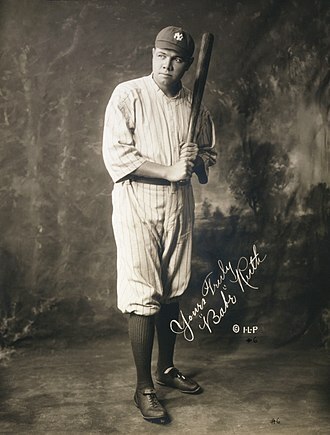 Foxx was often called the right-handed Babe Ruth, but his career was the opposite of Ruth in this regard. Ruth began his big-league career as a pitcher; Foxx ended his big-league career as one. A series of bad investments left Foxx broke by 1958. In the early 1960s he lived in Galesburg, Illinois where he was reduced to working as a greeter at a locally owned steak house. He eventually retired to suburban Cleveland in Lakewood, and was employed by the Lakewood Recreation Department. His two children, a daughter and son, also lived in Lakewood. His son, Jimmie Foxx, Jr., was an outstanding football player at Lakewood High School and at Kent State University. A statue of Foxx was erected in his hometown of Sudlersville, Maryland, on October 25, 1997. 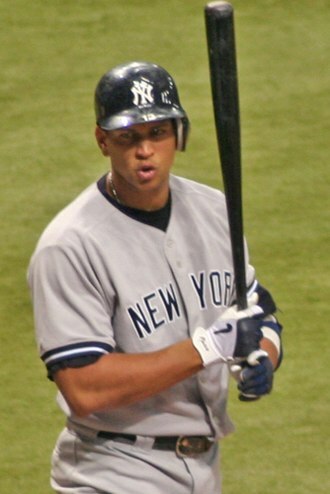 In 1999, he ranked number 15 on The Sporting News' list of the 100 Greatest Baseball Players, and was a nominee for the Major League Baseball All-Century Team. 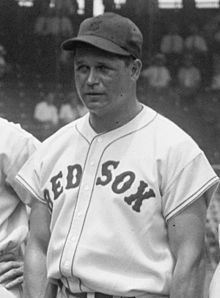 ^ "Jimmie Foxx Statistics and History | Baseball-Reference.com". Baseball-Reference.com. Retrieved 2016-01-14. ^ "Jimmie Foxx". 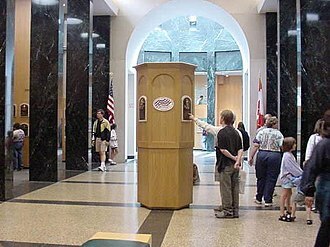 Baseball Hall of Fame. Retrieved 28 July 2012. ^ "Jimmie Foxx". Baseball Hall of Fame. Retrieved 2016-01-14. ^ "Jimmie Fox: July 29, 1929". Time. Retrieved August 20, 2013. 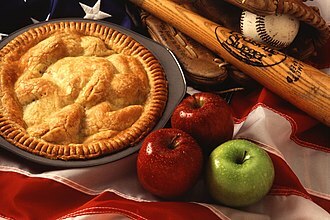 ^ "James E. Foxx AAGPBL Player/Profile". ^ a b espn.com, Reel Life: 'A League of Their Own', accessed August 19, 2013. ^ Edes, Gordon (September 12, 2006). "Foxx news channeling: Ortiz's run prompts a glance into history". Boston Globe. Retrieved July 21, 2012. ^ "100 Greatest Baseball Players by The Sporting News : A Legendary List by Baseball Almanac". www.baseball-almanac.com. Bennett, John. 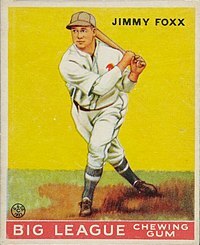 "Jimmie Foxx". SABR. Nack, William (August 19, 1996). "Lost In History". Sports Illustrated. From 1929 to 1931, the Philadelphia A's were the best team in baseball, with four future Hall of Famers and a lineup that dominated Babe Ruth's legendary Yankees. So why hasn't anyone heard of them? 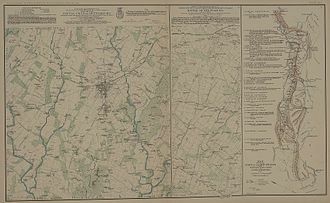 The Boston Red Sox are an American professional baseball team based in Boston, Massachusetts. The Red Sox compete in Major League Baseball as a club of the American League East division. The Red Sox have won eight World Series championships and have played in 13, founded in 1901 as one of the American Leagues eight charter franchises, the Red Sox home ballpark has been Fenway Park since 1912. The Red Sox name was chosen by the owner, John I. Taylor, around 1908, following the lead of previous teams that had known as the Boston Red Stockings. Boston was a dominant team in the new league, defeating the Pittsburgh Pirates in the first World Series in 1903 and winning four more championships by 1918. Following their victory in the 2013 World Series, they became the first team to win three World Series trophies in the 21st century, including championships in 2004 and 2007. Red Sox history has marked by the teams intense rivalry with the Yankees. The Boston Red Sox are owned by Fenway Sports Group, which owns the Liverpool F. C.
of the Premier League in England. The Red Sox are consistently one of the top MLB teams in road attendance. From May 15,2003 to April 10,2013, the Red Sox sold out every home game—a total of 820 games for a professional sports record. 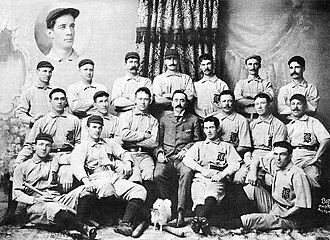 Neil Diamonds Sweet Caroline has become an anthem for the Red Sox, the name Red Sox, chosen by owner John I. Taylor after the 1907 season, refers to the red hose in the team uniform beginning 1908. Sox had been adopted for the Chicago White Sox by newspapers needing a headline-friendly form of Stockings. 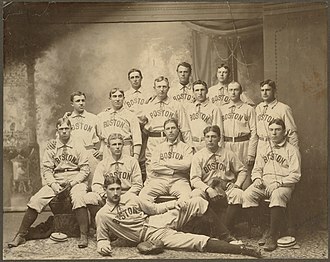 The team name Red Sox had previously used as early as 1888 by a colored team from Norfolk. The Spanish language media sometimes refers to the team as Medias Rojas, the official Spanish site uses the variant Los Red Sox. The Red Stockings nickname was first used by a team by the Cincinnati Red Stockings. Managed by Harry Wright, Cincinnati adopted a uniform with white knickers and red stockings and earned the famous nickname, the Boston Red Stockings won four championships in the five seasons of the new National Association, the first professional league. 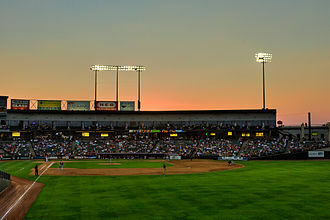 The Oakland Athletics, a current Major League Baseball franchise, originated in Philadelphia. This article details the history of the Philadelphia Athletics, from 1901 to 1954, see also, Philadelphia Baseball Wall of Fame The Western League had been renamed the American League in 1900 by league president Bancroft Johnson, and declared itself the second major league in 1901. Johnson created new franchises in the east and eliminated some franchises in the West, Philadelphia had a new franchise created to compete with the National Leagues Philadelphia Phillies. 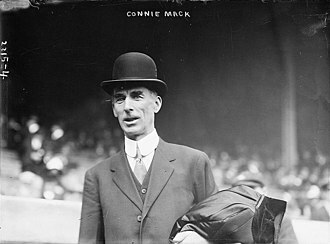 Former catcher Connie Mack was recruited to manage the club, Mack in turn persuaded Phillies minority owner Ben Shibe as well as others to invest in the team, which would be called the Philadelphia Athletics. Mack himself bought a 25% interest, while the remaining 25% was sold to Philadelphia sportswriters Sam Jones, the new league recruited many of its players from the existing National League, persuading them to jump to the American League in defiance of their National League contracts. One of the players who jumped to the new league was second baseman Nap Lajoie and he won the A. L. s first batting title with a.426 batting average, still a league record. The Athletics and the American League received a setback when, on April 21,1902, the Pennsylvania Supreme Court invalidated Lajoies contract with the Athletics and this order, was only enforceable in the Commonwealth of Pennsylvania. 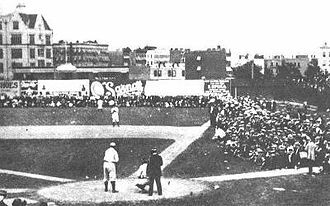 Lajoie was sold to Cleveland, but was out of road games in Philadelphia until the National Agreement was signed between the two leagues in 1903. In the early years, the As established themselves as one of the dominant teams in the new league, winning the A. L. pennant six times and they won over 100 games in 1910 and 1911, and 99 games in 1914. 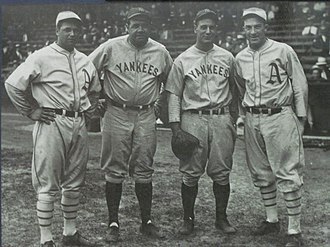 The team was known for its $100,000 Infield, consisting of Stuffy McInnis, Eddie Collins, Jack Barry, Rube Waddell was a major pitching star for the As in the early 1900s. 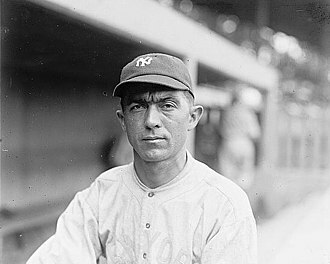 According to Lamont Buchanan in The World Series and Highlights of Baseball, Plank holds the franchise record for career victories, with 284. The Philadelphia Baseball Wall of Fame is a collection of plaques, mounted on a brick wall in the Ashburn Alley section of Citizens Bank Park, the ballpark of the Philadelphia Phillies. Once Veterans Stadium closed in 2003, the wall used to recognize the Phillies members were moved to Citizens Bank Park, however. Mack, the Athletics first inductee, had an 11-year playing career in the National League and the Players League, but is most remembered for his managerial career, twenty-one members of the Wall of Fame are members of the Baseball Hall of Fame. All of the inductees in the first four seasons from both teams are members, Del Ennis was the first non-member to be inducted. The first figures to be inducted into the Wall of Fame were Robin Roberts, who was inducted for the Phillies, Roberts pitched in Philadelphia for 13 seasons as a member of the National League team, and Mack managed the American League club from 1901 to 1950. In 1983, rather than inducting a player into the Wall of Fame, the Centennial Team includes players from several periods in Phillies history. The 1929 World Series featured the Philadelphia Athletics and the Chicago Cubs. The Athletics beat the Cubs decisively in five games and it was the last occurrence of an inside-the-park home run in a World Series game until Game 1 of the 2015 World Series. Ehmke went on to start Game 5 but failed to get out of the inning, the bullpen. AL Philadelphia Athletics vs. NL Chicago Cubs This was the first World Series game ever played at Wrigley Field and he proved his shrewd manager right, striking out thirteen Cubs for a Series record that would stand until 1953. Mack had rested Howards arm by sending him to scout the Cubbies for the last few weeks of the season, ehmke notched 13 strikeouts in the game, besting the World Series record of 12 set by Ed Walsh in 1906. Attending Game 1 was 9-year-old John Paul Stevens, who would grow up to become a Supreme Court Justice, a lifelong Cub fan, Stevens said, And that was my first game, a tragic game for a young boy to go and see in person. Jimmie Foxx became the first player to homer in his first two World Series games, Game 3 was a strong showing of two defensive teams at their best, a classic pitchers duel and a nail-biter. George Herman Babe Ruth Jr. was an American professional baseball player whose career in Major League Baseball spanned 22 seasons, from 1914 through 1935. Ruth established many MLB batting records, including home runs, runs batted in, bases on balls, slugging percentage, and on-base plus slugging. Ruth is regarded as one of the greatest sports heroes in American culture and is considered by many to be the greatest baseball player of all time, in 1936, Ruth was elected into the Baseball Hall of Fame as one of its first five inaugural members. At age seven, Ruth was sent to St, in 1914, Ruth was signed to play minor-league baseball for the Baltimore Orioles but was soon sold to the Red Sox. By 1916, he had built a reputation as a pitcher who sometimes hit long home runs. With regular playing time, he broke the MLB single-season home run record in 1919, after that season, Red Sox owner Harry Frazee sold Ruth to the Yankees amid controversy. The trade fueled Bostons subsequent 86 year championship drought and popularized the Curse of the Bambino superstition, in his 15 years with New York, Ruth helped the Yankees win seven American League championships and four World Series championships. As part of the Yankees vaunted Murderers Row lineup of 1927, Ruth hit 60 home runs and he retired in 1935 after a short stint with the Boston Braves. During his career, Ruth led the AL in home runs during a season twelve times, Ruths legendary power and charismatic personality made him a larger-than-life figure in the Roaring Twenties. During his career, he was the target of press and public attention for his baseball exploits. His often reckless lifestyle was tempered by his willingness to do good by visiting children at hospitals, after his retirement as a player, he was denied a managerial job in baseball, most likely due to poor behavior during parts of his playing career. In his final years, Ruth made many appearances, especially in support of American efforts in World War II. In 1946, he became ill with cancer, and died two years later, George Herman Ruth Jr. was born in 1895 at 216 Emory Street in Pigtown, a working-class section of Baltimore, named for its meat-packing plants. Its population included recent immigrants from Ireland and Italy, Ruths parents, George Herman Ruth, Sr.
Gordon Stanley Mickey Cochrane, nicknamed Black Mike, was an American professional baseball player and coach. 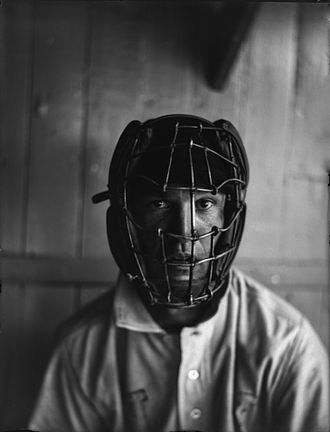 He played in Major League Baseball as a catcher for the Philadelphia Athletics, Cochrane was considered one of the best catchers in baseball history and is a member of the Baseball Hall of Fame. Cochrane was born in Massachusetts and was an athlete at Boston University. After college, he chose baseball over basketball and football and he made his major league debut in 1925, having spent only one season in the minor leagues. He was chosen as the American League Most Valuable Player in 1928, Philadelphia won the first two of those World Series, but Cochrane was criticized for giving up stolen bases when his team lost the series in 1931. Cochranes career batting average stood as a record for MLB catchers until 2009, cochranes career ended abruptly after a near-fatal head injury from a pitched ball in 1937. 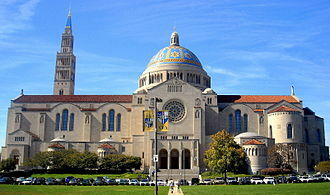 After his professional career, he served in the United States Navy in World War II. Cochrane died of cancer in 1962, in 1999, The Sporting News ranked him 65th on its list of the 100 Greatest Baseball Players. 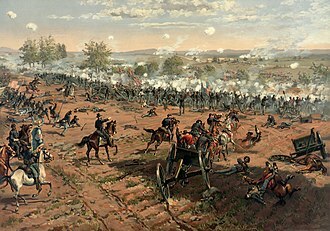 Cochrane was born in Bridgewater, Massachusetts to Northern Irish immigrant John Cochrane, whose father had immigrated to Ulster from Scotland and he was known as Black Mike because of his fiery, competitive nature. Cochrane was educated at Boston University, where he played five sports, after just one season in the minor leagues, Cochrane was promoted to the major leagues, making his debut with the Philadelphia Athletics on April 14,1925 at the age of 22. He made an impact by becoming Connie Macks starting catcher in place of Cy Perkins. A left-handed batter, he ran well enough that manager Mack would occasionally have him bat leadoff and he hit third more often, but whatever his place in the order his primary role was to get on base so that hard-hitting Al Simmons and Jimmie Foxx could drive him in. 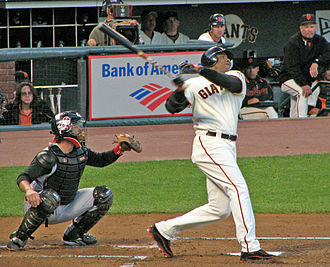 In May, he tied a major league record by hitting three home runs in a game. David Ortiz is the most recent player to hit 500 home runs, one of 12 to reach the milestone from 1999 to 2015. Longtime manager Connie Mack, pictured in 1911.